If you find it difficult to understand IMO conventions, nothing is wrong with you. Conventions are written in the language of international laws which is not the language me and you would normally speak. It is the language of the maritime lawyers. And till the time we are not practicing maritime law, we do not need to worry about the language of the conventions. But seafarers, specially senior officers need to understand the essence of each convention related to the maritime field. At the least we need to know what each convention aim to achieve. In my previous articles, I tried to simplify some of the conventions like Hague-Visby rules, CLC convention, Fund convention and Salvage convention. Today I will try to simplify SUA convention which is”Convention for the Suppression of Unlawful Acts Against the Safety of Maritime Navigation”. 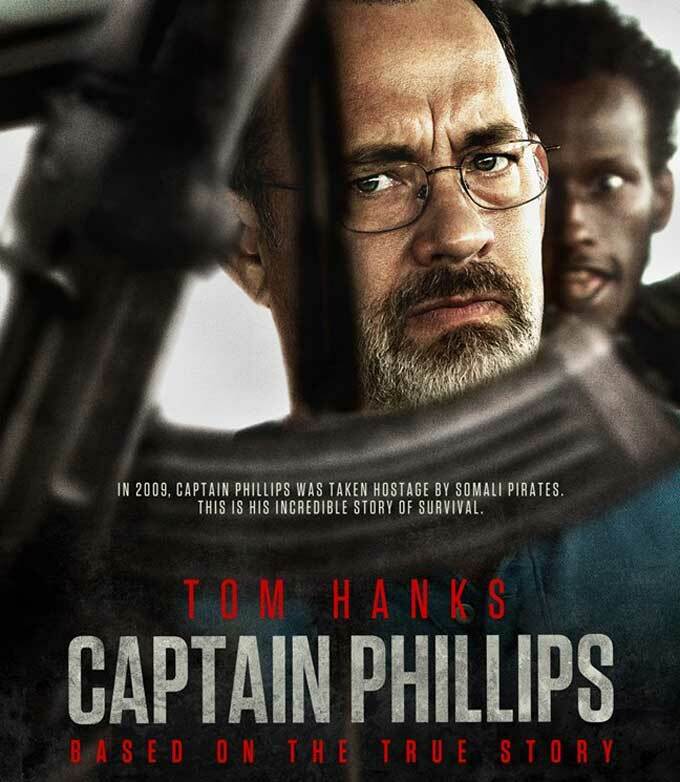 Have you watched the movie “Captain Philips”? Even if you have, allow me to give a brief about the story for the benefit of those who haven’t watched the movie. The story is about the container ship Maersk Alabama which was attacked & boarded by the Somalian pirates. With ship’s staff heroic, the pirates were made to leave the ship but they managed to leave in the lifeboat alongwith the Captain. 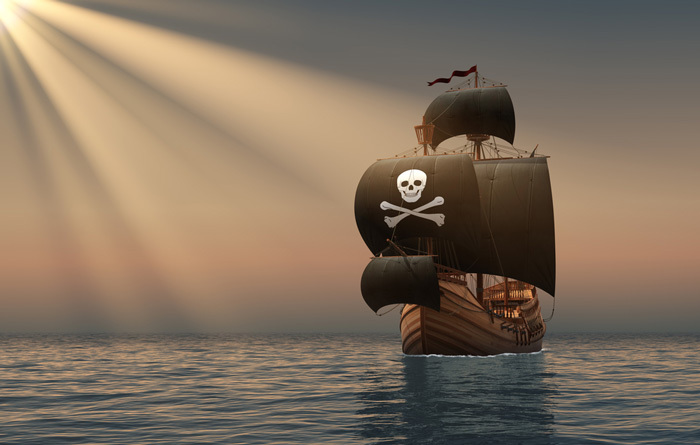 The US Navy was involved and the captain was released from the pirate’s captivity. In this whole battle, 3 out of 4 pirates were killed and one was arrested by the US navy. Now here is my question. What could US do with that arrested pirate? Also what allowed the US navy to take action and kill the pirates? You could easily say that pirates did something wrong and they got paid for their misadventure. But that is not how the law of the land works. 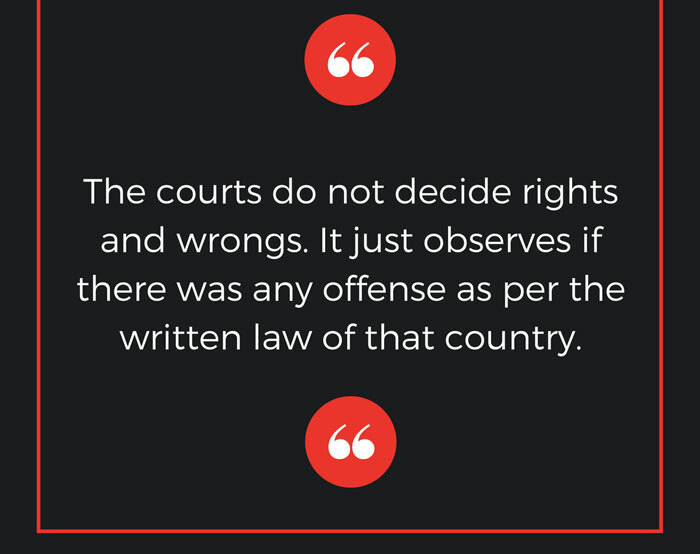 The courts do not decide the rights and wrongs. The court just observes if the actions of the person is offense as per the written law that they follow. I have no food to eat and I was dying of hunger. boarding a ship forcefully and snatching some money from the ship and ship-owners is my business and my job. I was just doing my job. I haven’t broken any law. In fact that is what the arrested pirate did during the hearing in US court. Believe me, even though we all know it is not right morally, the pirate cannot be sentenced as it is not about what is right or wrong. It is all about if there is any law (International or local) that they broke. And when the issue is something that affects most part of the world, local laws cannot be effective. The local laws need to be brought together with an international convention. For the issues of crimes against ships, SUA convention is the framework that bind the local laws of the countries that has ratified it. It is important to mention that SUA convention (like any international convention ) is not the law in itself. It becomes the law when the country that ratifies the convention includes the provisions of the convention in their local laws of the country. SUA convention deals with the criminal issues. And like any criminal law, there are few common points that are addressed. To whom the law applies ? What are the areas of Jurisdiction of the states? What actions are considered to be offenses? What are the punishments for each of the defined offenses? The answer to these three questions more or less covers the SUA convention. Let us discuss each of these provisions. The convention applies to all the ships navigating in the high seas. 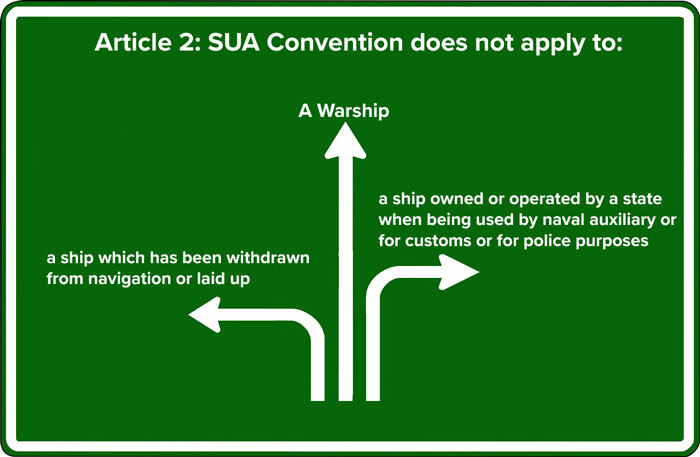 Article 2 of the SUA convention defines the applicability of the convention by defining ships for which the convention do not apply. If Somali pirates boarded a vessel in high seas away from the territorial waters of any state, can any state take action against the pirates when arrested. Again, “Yes” cannot be the answer. It need to be a written law. If and which state will have the jurisdiction and when. Article 6 of the SUA convention deals with the jurisdiction part. the offense is committed by national of the state. Now you know what allowed the USA to arrest and put the arrested pirate from Maersk Alabama under trial in USA. Because US had their jurisdiction as the offense was committed on board a ship that was registered in USA. As I discusses, any convention dealing with the issues relating to the crime need to define the offenses. Artcle 3 of the SUA convention defines the acts that would be treated as offenses. destroying or damaging a ship’s navigation facilities oe interfering with their operation if it is likely to endanger the safety of the ship. Communicating information which is known to be false, therby endangering the safety of the navigation of the ship. Injuring or killing someone while committing any of the above offenses. Being an accomplice to any of the above offenses. Compelling someone through threats to commit any of the above offenses. 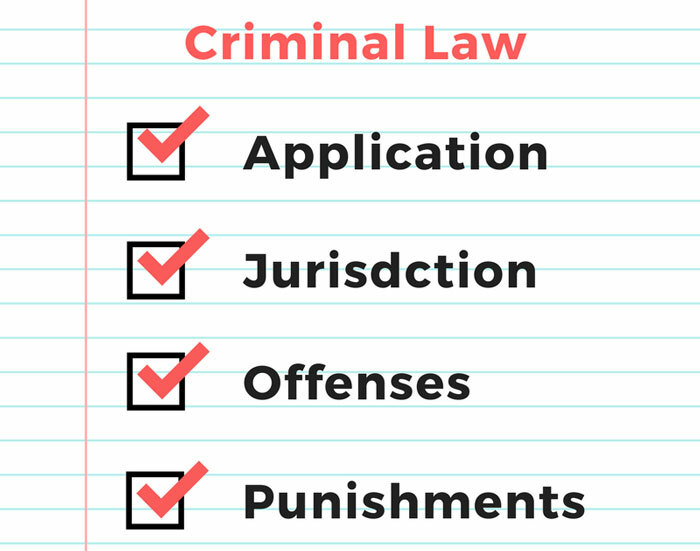 Another aspect of the criminal law is to define the punishment for each of the criminal offense. Article 3 of the SUA convention has defined the offenses and the states that ratifies the SUA convention need to include these offenses in the country’s local law. But what about the punishment for each of the offenses? SUA convention requires the states to define the punishment. The international convention cannot decide the punishment for any offenses. It is the matter for each of the state to decide. For example, some countries may require the hands of the convicted thieves to be cut as the punishment and other countries may have just few months (or years) of imprisonment as a punishment for the same crime. It would all depend upon how severe the offense is considered in that country. But SUA convention do urge the states to take into account the grave nature of the offenses while deciding on the penalities or punishment for the offenses. However SUA convention do require the states to make the offenses punishable. This means that if a country is agreeing to ratify the SUA convention, they cannot (in the country’s written law) let the offenders go away without any punishment. Each State Party shall make the offenses set forth in article 3 punishable by appropriate penalties which take into account the grave nature of those offenses. SUA protocol was introduced at the same time as the SUA convention. SUA protocol is the supplementary convention to the SUA convention. The only difference between SUA convention and SUA protocol is that this protocol deals with safety of fixed platforms. In the year 2005, a second supplementary Protocol to SUA was introduced. The 2005 Protocol adds provisions which criminalises the use of ships to transfer or discharge biological, chemical, or nuclear weapons. This means that a ship carrying biological, chemical or nuclear weapons is considered to be an offense. However, SUA convention allows the carriage of nuclear weapons under the control of a state that is party to the Treaty on the Non-Proliferation of Nuclear Weapons. An international convention is brought up to address an issue that not only affects the whole world but also involves the whole world. In these cases, having scattered local laws of each country can never solve the issue. An international convention is required that would bind the law of each country. Or If I can put it this way that an international convention is required to bring uniformity in the law of affected countries. SUA convention is one such international convention that deals with the Suppression of Unlawful Acts Against the Safety of Maritime Navigation. The answer to these questions more or less covers the SUA conventions. Hello sir it's amazing to to read your blogs i have gained good knowledge just beacause of your blogs. Can you please tell me what is the procedure for switching on echo sounder . And when it is required so switch off echo sounder? Will the transducer get affected if we keep echo sounder switched on while navigating in deep oceans ?? It will all depend upon the equipment. We need to check the echo sounder manual to see if it says anything about echo sounder to be switched off in higher depths. Apart from that, we need to follow company's navigation manual regarding switching off the echo sounder. Some companies require echo sounder to be switched off in depths greater than 200 meters. Other companies require it to be kept on at all times. Hats off to u sir, way u explain things in such a layman terms that even people with zero IQ vil understand, everytime i read ur blogs it makes me a better seafarer, thnx alot sir for ur hardwork & knowledge. Sir can u please explain echosounder pythagagoras error formula proof? Thank you very much for the efforts Captain, found it helpful and simple for all. Sir how can we differentiate between Sua and unclos convention. Just one main difference. I think UNCLOS does not deal with the criminality part and does not even talk about the punishments either. I am afraid to say that there is no way other than to request on logical reasoning.